Julian Smedley started his musical career as a choirboy in an English Cathedral. As a violinist he performed regularly on BBC television & radio both as a soloist and an orchestral player. He co-founded the Bowles Brothers Band that recorded on Decca Records. After moving to Washington State he joined Cornish Institute's jazz orchestra, playing with guests such as Art Lande, Ralph Towner, Gary Peacock, and Gil Evans. 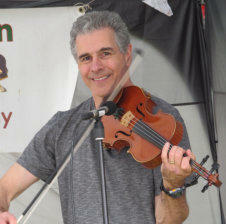 A Bay Area resident since 1985, he's a violinist with the Hot Club of San Francisco and the Connie Doolan Quartet and he tours with Paul Horn. Recently he's been recording CD projects including a commissioned work for UC Berkeley's dance theater, which premiered at Berkeley's Zellerbach Playhouse in Spring 2005.